MANILA, Philippines - The official results, list of passers, top examinees and other important announcements for March 2018 Civil Service Exam - Pen and Paper Test (CSE-PPT) both for professional and subprofessional levels are released by the Civil Service Commission (CSC) within sixty (60) days after the eligibility examinations. 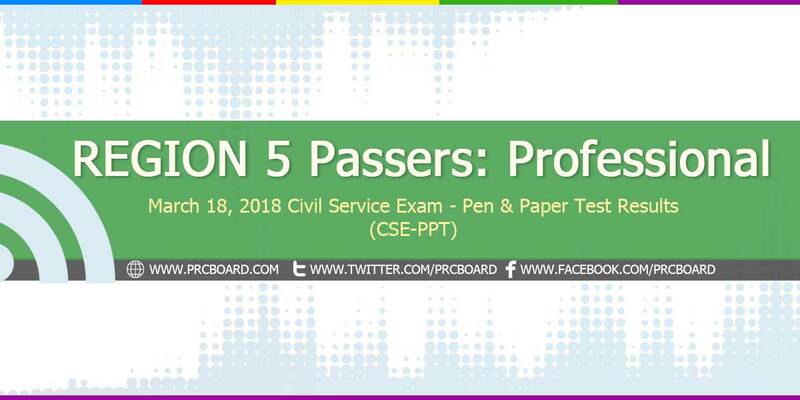 Below is the complete list of passers for March 2018 CSE-PPT Professional Level in Region 5 (Bicol Region). Kailan po talaga ang release ng passers sa civil service(prof and nonprof)? ang tagal naman ng release ng result.. bakit yung ibang professional exams ang bilis lang? Excited but at the same time feeling nervous..
bukas na siguro lalabas ang result! :( extended na naman yung takot at kaba!